Editor of these books is Mercedes Shull, another woman in the business. Again, Virginia Provisiero takes over for the last two issues. By the way: almost all of the books are available to view and/or download at the Digital Comic Museum. I took care of some missing issues. So enjoy. And I’m working on completing the whole run, of course. Every issue has been freshly indexed (with the fabulous help of art spotting wizard Jim Vadeboncoeur, Jr.) on the Grand Comics Database – the link will show you all available data, including cover shots and story descriptions. Stories posted on the internet are linked (also marked with an underline). Miniature splash pages tell you that this story has been posted on our horror websites – click to read the whole stories. It’s June 1952 and Fawcett launches TWO more horror books (apart from the existing WORLDS OF FEAR and THIS MAGAZINE IS HAUNTED, add to this BEWARE! TERROR TALES, started just a month ago): STRANGE SUSPENSE STORIES and UNKNOWN WORLD. Things are getting messy in the art spotting department as well. Two of the three stories had been credited to the wrong artists, before we sent in the cleaners. It’s good ol’ Shelly Moldoff again on the lead story, of course, the creator of Fawcett’s horror line (and NOT Forgione & Abel); one comparing look into previous issues would have sufficed. And the last story is surely NOT drawn by Brown & Gantz (of “Purple Claw” fame). Though at a fleeting glance it might have been. Problem is, this kind of artwork we see in “Footprints On The Ceiling” could be any one out of three dozen guys using that style, starting with Forgione (why not?) and rounding up more usual suspects like Belfi, Tyler, Nodel, Brown, Peddy & Sachs or even Molno. This style or drawing is an art spotter’s nightmare. Anyway, we (that is me and Jim Vadeboncoeur, Jr.) would like to add yet ANOTHER FRESH NAME to the line-up: William Weltman. We encountered this forgotten craftsman while studying all of the books by the Premier company. One of them is signed (“Weltman”) and looks shockingly adequate. Have a look at TRUE LOVE CONFESSIONS #3 – if you dare! You can access it HERE at DCM. What about the three stories? “The Sea Of The Dead” features a man being chased through limbo – this time it’s a captain aboard the ghost ship he wrecked years ago. Variation #4 –we’ll keep count! 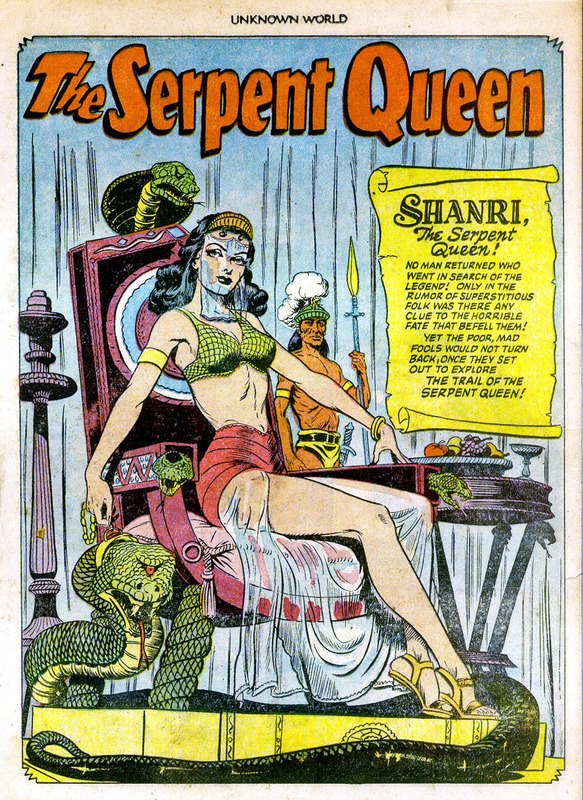 Big surprise in “The Serpent Queen”: Bob McCarty can draw girls! First time I lay eyes on a McCarty female character – and it’s a beautiful pin-up splash. It’s a gripping, fantastic and well-executed tale of adventurism. This issue’s winner. Whereas “Footprints On The Ceiling” is one of the most inane and bizarre horror stories ever written: The gangsters O’Flaherty and Flitcher train a revived dead dog to be a trick dog on stage. But they have to fight off hordes of skeletal zombies coming after them to bring the dog where it belongs – in the province of the dead. Hard to believe, I know. Please read it, you won’t ever forget it. And there’s a nice, stylish text story (“The Quiet One”) to spot – about two old boarders inhabiting a respectful boarding house and concealing one fantastic secret. Forgot to mention in the last issue entry that this is the now second painted cover by Norman Saunders. Three more will follow (plus his sensational work for WORLDS OF FEAR #10). These six Saunders covers are considered to rank among the most beautiful in all of pre-code horror history. SSFAW #2 is a rather run-of-the-mill horror book. Not bad at all, but it won’t knock your socks off, either. 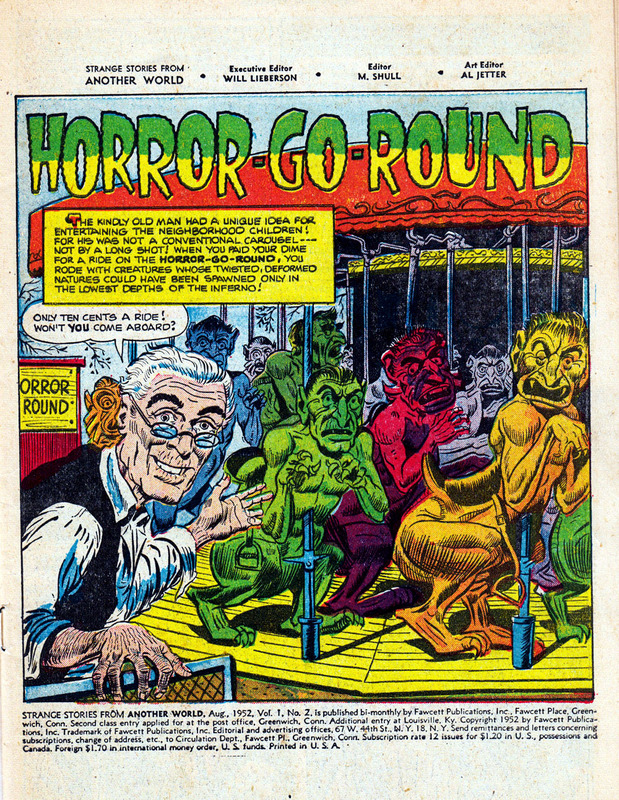 “Horror-Go-Round” is a quirky Bob McCarty contribution (only saved by the highly inventive merry-go-round-idea); and “Hands Of Vengeance” is an uninspired job by horror newbie Ed Waldman. He will do better. 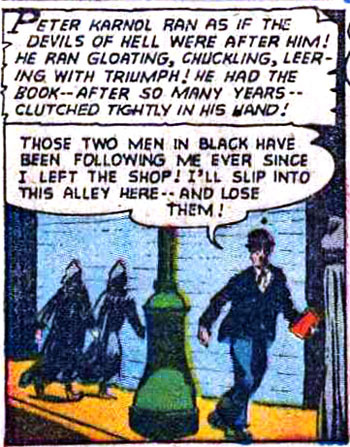 So this issue’s highlight to me is Moldoff’s “Death’s Beggar”, a cruel tale packed with pages of gratuitous violence. Posted and discussed it on my German website. Ugh! Ed Waldman draws crude faces in “The Dark Mirror”, see for yourself. What’s interesting to me about this story is the fact that this could have been a script for Ace’s HAND OF FATE series. 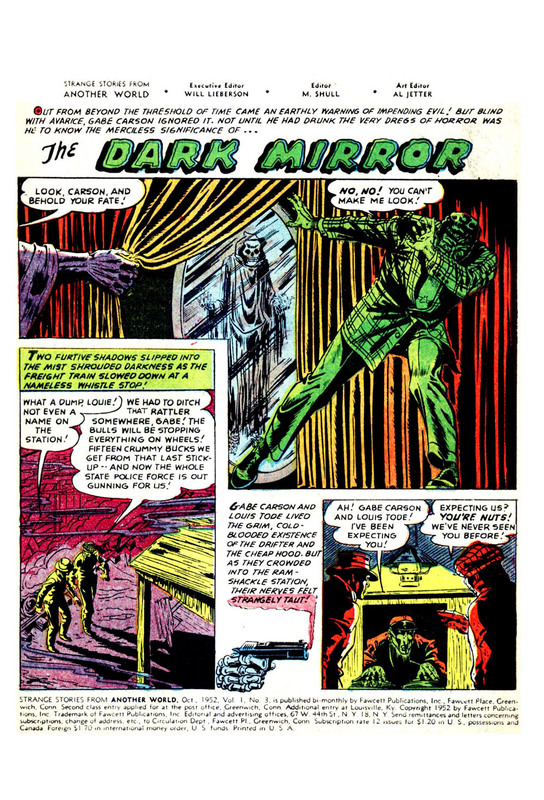 In “The Dark Mirror” a fate character interferes with the life of two hoodlums, urging them to change their criminal ways. They don’t listen, of course, and meet their horrible ends. Leaving behind a triumphant Fate: Told you so! Nice text story again (“Death To The Dreamers”) by John Martin. Devils disguise as doctors in an insane asylum and feed on the souls of the unlucky patients. 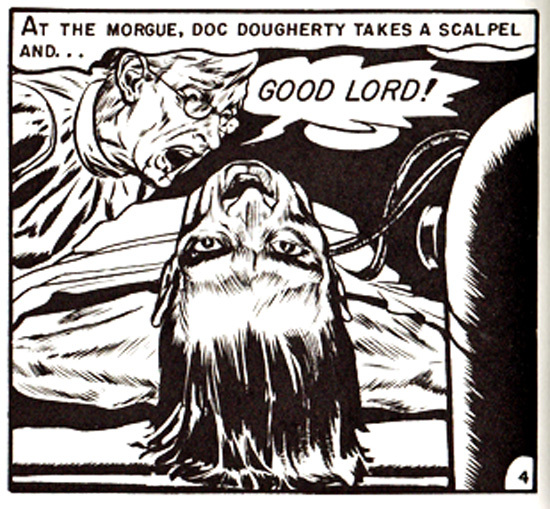 And here’s Moldoff’s discovery of a corpse. Is this some kind of personal vendetta? Is Moldoff FIENDISHLY using panels from EC books to get back at his former employer?? 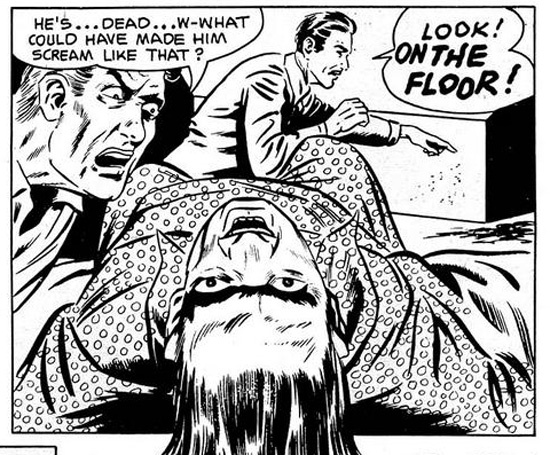 Are there MORE of these “cloned panels” hidden in FAWCETT HORROR??? If YOU find something, please tell us! There is a black-and-white version of “The Thing From The Lake” posted on Pappy’s delightful Golden Age Comics Blogzine, click on title. Interesting to see the artwork in pristine condition, because the coloration at FAWCETT HORROR is really frightful! Should you want to compare with the colored version, please look up the whole issue on the Digital Comic Museum, under this LINK. We didn’t think the story good enough to be posted on these pages. 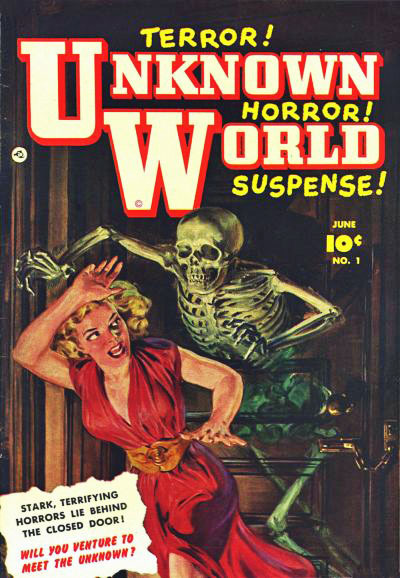 “The Unseen” is a variation of “The Man Who Saw Too Much”, published the same month in the sister title THIS MAGAZINE IS HAUNTED #7. In both stories the protagonists are plagued by being able to see ghosts from the beyond – once through a camera, once through magic glasses. That much for Fawcett writing efficiency. Have you showered or are you just frightened to see me? And another fantastic cover by Norman Saunders, one of the best pre-code horror titles ever. A stylish zombie in attack mode! “Monsters Of The Mind” is an alien conspiracy yarn, too long, but fairly entertaining. See it posted on Karswell’s terrific blog “The Horrors Of It All”. 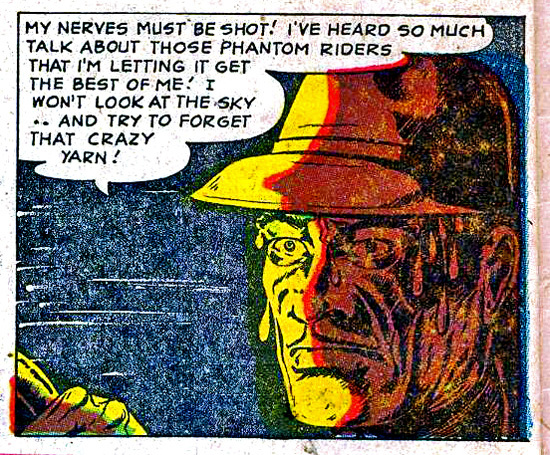 And we have no winner with “Phantom Riders In The Sky” either. A one-dimensional gangster-on-the-run story so lengthy you’ll find yourself skipping panels just to get it over with. It’s a very mediocre horror book all in all. Showing you one fun panel, though. Here Ed Waldman’s trying to “outsweat” Rudy Palais, the grand master of depicted perspiration. Damn! Devils on my heels! Last issue and the first to break the mould: four stories instead of Fawcett’s standard three (up to that time). As you will see, the complete issue is posted on Karswell’s fantastic blog “The Horrors Of It All” (click underlined titles to read the respective stories). Beautiful Bob McCarty splash in “Dance Of The Doomed”, an otherwise ambivalent story about a man seeking out evil – and finding it, of course. 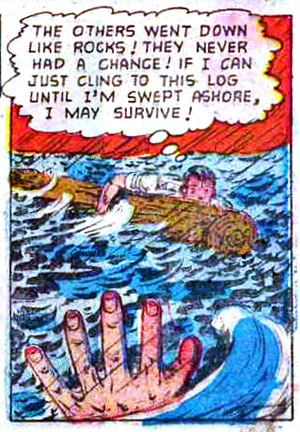 There are strong moments and feeble ones (must so many comic book personnel die by running into speeding trucks?) and funny ones. “Peter Karnol ran as if the devils of hell were after him”. And they are, look for yourself. “Vampire’s Daughter!” proves to be quite a delight. Young Althea is modeled into being a movie star by unscrupulous Hollywood propaganda – claiming that she is a real vampire! Fun read, even Moldoff’s matter-of-fact artwork is adequate. And it’s maniacal entertainment again with “The Rain, The Deadly Rain!” where a run-of-the-mill curse plot about an angry rain god (!) 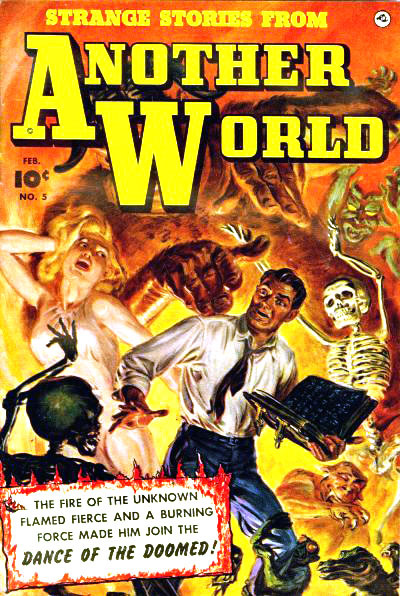 takes unexpected twists at the end (a human sacrifice and a scene of gratuitous violence unparalleled since “Death’s Beggar”, published in the second issue of STRANGE STORIES FROM ANOTHER WORLD (as you may recall). “The Flaming Witness” does not disappoint either. On the surface it’s similar to the last one, the rain god now being a flame ghost coming to claim his tormentor. But on a deeper level there’s a definite EC touch to this story. Bill Gaines’ and Al Feldstein’s success formula is copied quite elegantly in the plot of “The Flaming Witness”: a fast-paced introductory crime to get things rolling; a lot of action to contain the following curse; a moment of deceptive safeness for the killer; the onslaught of unexpected supernatural horror! In the guise of the well-tried poetic justice twist, of course. Damn! SSFAW goes out with its best issue! Each 1: Maurice Gutwirth, William Weltman. No stories by Bob Powell and George Evans in this series. But all covers by Norman Saunders. 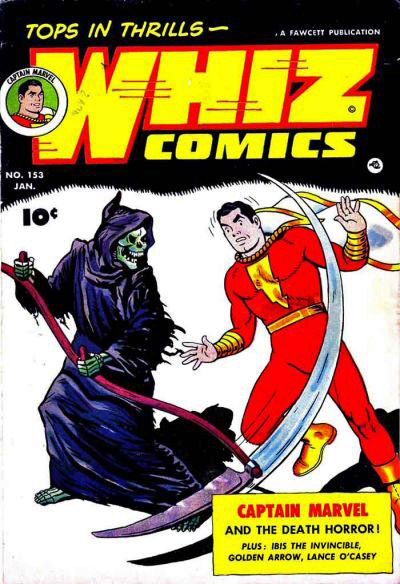 Looks as if Billy Batson has to battle the grim reaper in person. Turns out it’s a crooked scientist using a giant ray machine to make everyone appear as a skeleton. Fun story with a surprising overture. We’d loved to post it here as a salute to Fawcett’s great Captain Marvel. But it’s a tricky and small GIF-file. So please go see it at the Digital Comic Museum by clicking HERE. Two gendarmes inquire about a mysterious beheading in a supposedly abandoned French castle. The last descendant of a murderous marquis has become the victim of a centuries old curse. Ghosts of the past have arisen from the dust and executed their revenge. There is an Old Witch type person appearing as narrator IN the story, although the formal introduction TO the story is delivered by Fawcett horror host Dr. Death. That’s a bit awkward; and the Old Witch looks every facial hair an EC rip-off. Only this time it’s not Moldoff, but Weltman (possibly, possibly…). Jaspar, a veteran form the Spanish-American war, is killed by the greedy Waldo. When the old man’s treasure reveals itself to be worthless medals, Waldo flees over the cemetery and gets killed by the ghost of Jaspar. That’s a weak one; I suspect they didn’t dare dishing out the good stuff in the more kiddie orientated WHIZ magazine.